We blend all our chemicals here in the UK in our ISO 9001 accredited production facility for our clients and toll blend. 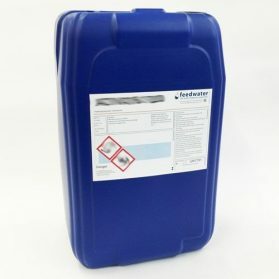 Feedwater is a manufacturer and supplier of a range of high-quality water treatment chemicals for all types of closed circuit heating, cooling and chilled water systems. Closed circuit or closed loop water systems are a convenient way of heating or cooling building services applications and industrial and commercial processes. As the name closed loop suggests the intention is generally to retain the same water in the system for an indefinite period which means that without effective water treatment corrosion products and foulants can build up impairing flow and heat transfer and control valves can become blocked and inoperative. Heating systems can become scaled up; chilled water systems can become choked with pseudomonas slime-forming bacteria. A poorly treated closed circuit water system will be wasting your money long before it starts to leak. 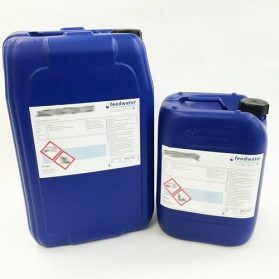 To overcome these many potential problems we have developed a comprehensive range of cost effective inhibitors and biocides which are designed specifically for closed systems. If your system is already suffering because of inadequate water treatment don’t despair because we can provide products and services which will restore flow and heat transfer to even heavily fouled systems. We often get questions relating to the control of closed water systems, some of the most frequent are included below, the buttons will link to articles, products and lists to help you identify how to correctly treat your closed system. To take advantage of our free consultancy service and have one of our service consultants visit your site see the Consultancy Service tab above. What chemical reserves do I need? Which chemical inhibitor should I use? Which Bacteria should I test For? 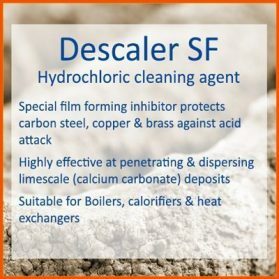 Which biocide should I use? Can Feedwater test my Closed System? 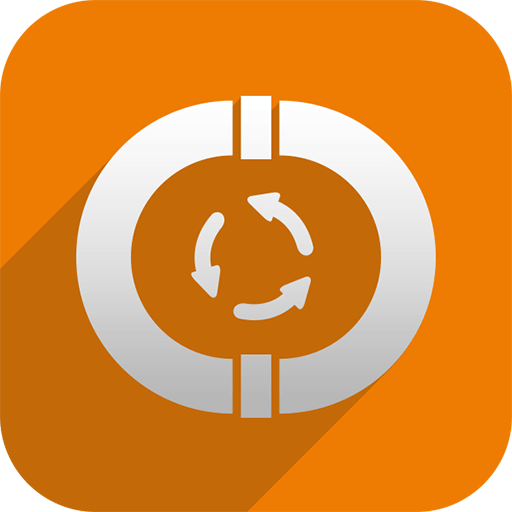 Closed circuit inhibitors are matched to the system metallurgy and operating temperature. Most of the inhibitors are designed to protect a range of different metals but particular care needs to be taken if a system contains aluminium. Corroban 22 is a DEHA based oxygen scavenger which is used in the treatment of HTHW systems. 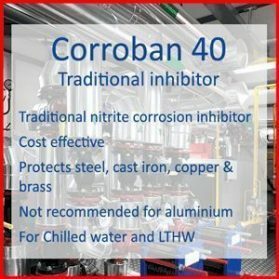 Corroban 40 is an industry standard nitrite based closed circuit corrosion inhibitor for LTHW and chilled water systems. Not suitable for systems containing aluminium. Corroban 41 is a new generation synergised nitrite closed system inhibitor which gives the same level of protection as traditional treatments but at a much lower dosage rate. It is ideal for MTHW, LTHW and chilled water systems. Not suitable for systems containing aluminium. 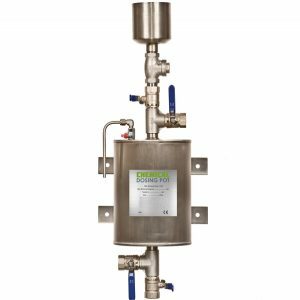 Corroban 42 is a special synergised nitrite treatment developed specifically for heating and chilled water systems containing aluminium. Corroban 48P is a highly concentrated nitrite based chilled water corrosion inhibitor that can also be used for LTHW and other closed systems incorporating a pink pH indicator. Not suitable for systems containing aluminium. 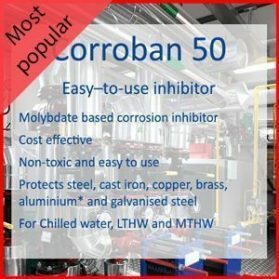 Corroban 50 is a synergised molybdate / organic corrosion inhibitor which is ideal for MTHW, LTHW and chilled water systems, including those containing aluminium. 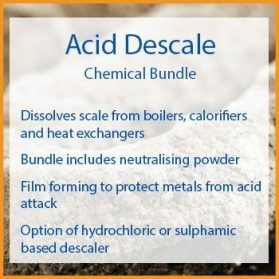 Because it is a synergised blend it is able to provide excellent protection at much lower molybdate reserves and much lower cost than conventional molybdate treatments. 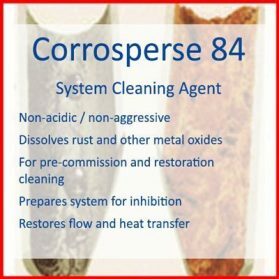 Corroban 55 is a synergised closed loop corrosion inhibitor which incorporates both nitrite and molybdate. It is ideal for MTHW, LTHW and chilled water systems. Not suitable for systems containing aluminium. Polytan 4F is a tannin based oxygen scavenger and heating system corrosion inhibitor which is used in the treatment of larger, predominantly steel, systems which can be used across the temperature range from chilled water to HTHW systems. Description and usage instructions below. Don’t forget your Biocide and Nitrite Test Kit! If untreated closed heating/cooling systems can become a breeding ground for a range of troublesome microbes such as pseudomonas, nitrifying and sulphate reducing bacteria. They can cause fouling, destroy closed loop inhibitors and cause MIC (microbially induced corrosion). 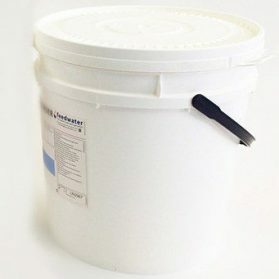 A chilled water biocide is essential to prevent slime growth and we would always recommend a closed circuit biocide is incorporated in any system operating below 80 °C. 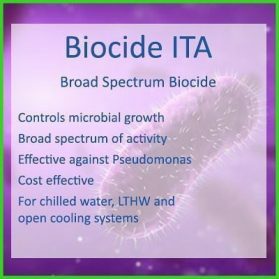 Biocide ITA is a broad spectrum closed loop biocide which effectively controls all the commonly encountered bacteria in closed water systems. 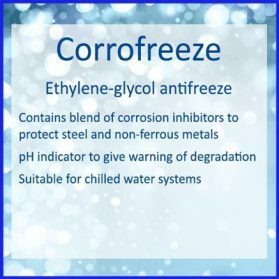 Corrofreeze is an inhibited mono ethylene glycol antifreeze designed specifically for use in chilled water systems in industrial and building services HVAC applications. Corrofreeze BPC is food-grade and pharmaceutical grade propylene glycol. 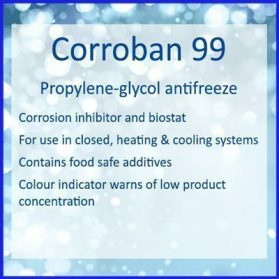 Corroban 90 and 99 are food-grade inhibited propylene glycol antifreezes that can also be used as bacteriastats to safely control microbial growth in food production applications. Description and dosage instructions below. 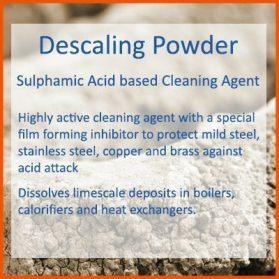 We produce a range of heating system cleaning chemicals and closed system chemicals for pre-commission cleaning, descaling and renovation cleaning of all types of closed circuit water systems. This can very much depend on the exact blend that your supplier uses in their closed system inhibitor chemicals but we can give you an overview of what chemical reserves we recommend for Feedwater products. All recommended reserves are stated on the product pages within the shop. As a synergised Molybdate based inhibitor we have two different chemical reserves we recommend. 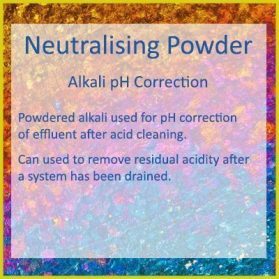 A traditional Nitrite blend the chemical reserves we recommend comes down to one result as we do not recommend using with Aluminium systems. You should dose to meet a reserve of 1200mg/l minimum. Our Synergised Nitrite blend has the benefit of requiring a much love nitrite reserve as the mix of organic and inorganic inhibitors offer protection at lower levels making it a much more cost effective solution. You should dose to meet a reserve of 200mg/l minimum. Tannin again is not suitable for Aluminium and lends it self to be a cost effective solution to very large and high pressured closed systems. The operator should look for a chemical reserve within the range of 12 – 20 tannin units. 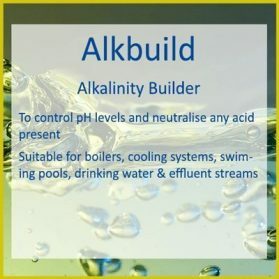 Further information regarding chemical reserves, what systems and materials are compatible with which treatments are available on the product pages. Not sure how big your systems are? Speak to us today to arrange a free consultation. Feedwater stock and supply dosing equipment for closed water systems. Contact us about ordering dosing pots and other dosing equipment. Any treatment chemical is only as good as the service that accompanies it and we’ve been treating closed systems for nearly 40 years. Our regional consultants look after hundreds of sites across the UK and are experts in the treatment of boilers so contact us today for all your closed loop water treatment chemicals and service requirements. 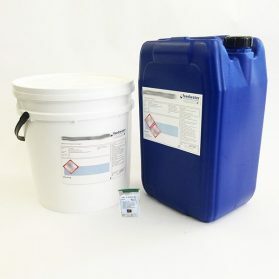 We can supply you with our closed system water chemicals with your own label on the drum. So if you are a water treatment service company, a closed water system specialist supplier or an FM company looking to increase your added value, why not contact us because we can help you. We are always looking for professional overseas partners and distributors, so if you are a water treatment specialist looking for an alternative supplier for your water treatment products, or you believe you have the capability to establish a high-quality water treatment service operation in your own territory, then please contact us.